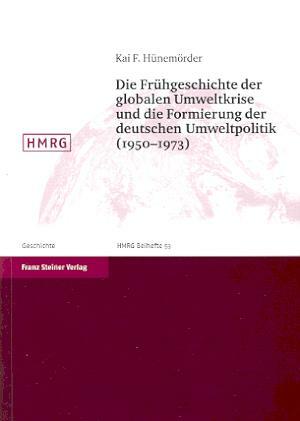 Hünemörder, Kai F. Die Frühgeschichte der globalen Umweltkrise und die Formierung der deutschen Umweltpolitik (1950–1973) [The early history of the global environmental crisis and the formation of German environmental politics (1950–1973)]. Stuttgart: Franz Steiner Verlag, 2004. Despite the fundamental importance of the global environmental crisis, there are no comprehensive studies that trace the perception of the crisis in politics and society on the basis of primary sources. This volume fills this gap and enriches the international discourse on global environmental crisis by adding a new level of historical depth to the discussion. — Franz Steiner Verlag website (in German).